Social workers must be prepared to look at the adult male survivor’s experience in a different light from that of a female survivor. When working with sexual abuse survivors, it’s important to remember that no two cases are exactly alike. 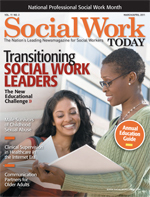 Although there are some similarities that can help social workers prepare and train to work with these clients, it’s still a mistake to lump male and female experience together, as they are unique in their own right. Over the years, sexual victimization has often become characterized as a “women’s issue,” and many social workers aren’t adequately prepared to work with adult male survivors as more emerge from their silence and struggle to overcome sexual abuse from their past. “When we talk about sexual violence, we know that trauma is fairly universal, regardless of one’s culture or gender,” adds Rick Goodwin, MSW, RSW, executive director of The Men’s Project based in Ottawa, Ontario, Canada. “But because our gender defines much of who we are and roots us in our upbringing, we do require a gendered lens to engage with male survivors.” In other words, social workers must be prepared to look at the male experience in a different light from that in which they view the female experience. For example, there are some notable differences that must be addressed when dealing with male clients. One involves masculine gender socialization. Gartner, who is the author of several books on sexual abuse, including Beyond Betrayal: Taking Charge of Your Life After Boyhood Sexual Abuse and Betrayed as Boys: Psychodynamic Treatment of Sexually Abused Men, says these factors make it difficult for men to open up about their experiences in the first place. Coupled with the fact that men are socialized to not verbalize emotions, it can be a challenge to get them to talk about what happened to them. In addition, if the perpetrator was a woman, which is more common than once thought, the victim may be even less willing to admit he was negatively affected by the experience. Frequently, men may start treatment because of another, though often related, issue, such as struggling with the sexual relationship in their marriage. It may take multiple sessions for the true history to unfold, but from the start, the client will likely be gauging whether he feels comfortable about opening up. Another key difference between the male and female experience comes down to confusion over sexual orientation. Because of the physical makeup and anatomy of the male species, the victim may have become aroused (had an erection) during the experience, even if he was an uncomfortable or unwilling participant. “Some perpetrators may use it against their victim, making them think that because they were aroused it was their fault,” says Ken Singer, MSW, LCSW, executive director of New Jersey’s Association for the Treatment of Sexual Abusers and past president of MaleSurvivor, “or say, ‘You’re gay—look, you have an erection.’” Singer, who is the author of Evicting the Perpetrator: A Male Survivor’s Guide to Recovery From Child Sexual Abuse, says this often makes young men unwilling to “tell” on the person who abused them. The idea that young men abused by men are or will become homosexual is just one myth that MaleSurvivor hopes to overcome. Another big myth is “vampire syndrome,” or the idea that boys who are sexually abused will go on to sexually abuse others, just like in the myth that those bitten by a vampire are destined to become vampires themselves. This has proven untrue, yet society continues to perpetuate the myth. Gartner adds that this is another issue men often must tackle, as opposed to female survivors, making it more challenging for men to come forward. Society isn’t so worried about sexually abused women becoming future pedophiles, but they generally embrace this belief with male victims. Though it’s a myth that all abused men will go down the wrong path themselves, certainly some do respond to their trauma with rage and/or violence, even if not becoming sexually abusive themselves, says Goodwin. This is another difference between male and female survivors. Unfortunately, there are not many training opportunities for social workers who want to work with adult male victims, and nationwide there are few organizations like MaleSurvivor, The Men’s Project, or The Men’s Center that really focus on men as these groups do. The experts say that while these programs are just starting to emerge, there are already many opportunities for social workers to educate themselves specifically on male victims. Gartner’s book Betrayed as Boys was written for therapists who are working with or plan to work with these clients. “That’s important because most of the books out there were written for sexually abused men, not for their therapists,” says Gartner. There’s no question that working with male survivors can require a delicate approach. Reading about survivors’ experiences will help social workers better understand what a victim is going through. Treatment often comes down to walking a fine line, according to Gartner. “On one hand, it’s very important not to give the impression that you’re interested in the details of the experience,” he says. That can make the patient feel pressured, and it can easily make them close down. Still, survivors do need to open up eventually to make treatment effective. Take a slow approach and don’t make the client feel pressured, says Gartner. “You obviously need to get the person talking because it’s important to know the details so they can start working it out. I always tell a client not to go faster than they can. You do not want to traumatize someone into sharing more details than they’re ready to share,” he says. In terms of a social worker’s gender, Goodwin says that’s a highly individualized issue that may or may not come into play. At The Men’s Project, there are both male and female therapists available as it’s an issue for some clients, while others may have no preference. And while many social workers simply won’t have the experience of having worked with actual victims, the more they educate themselves through reading and online resources such as MaleSurivor.org, the better they can relate to their clients.